In case of water or sewer emergency call HWU at 270-826-2824 (Answered 24/7/365). Description of Work: The Henderson Water Utility (Owner) hereby gives notice that sealed bids will be received for furnishing and installing a Storm Sewer on Riverdale Court in Henderson, KY.
BID OPENING: Sealed Bids will be received until 1:30 p.m., Local Time on 15 May 2019, in the offices of the Henderson Water Utility (HWU), 111 Fifth Street, Henderson, Kentucky, 42420. After the official bid closing time, the Bids will be publicly opened and read aloud. Questions regarding the Bid Documents and Plans should be directed to Tom Williams, General Manager, at the address listed above, during regular business hours. Telephone: 270.826.2421. LEGAL PROVISIONS: Bids shall include all required submittals as identified in the Bid Documents, including Bid, Performance and Payment Bonds. Description of Work: The Henderson Water Utility (Owner) hereby gives notice that separate, sealed bids will be received for a project to clean, paint and upgrade fire hydrants, in the Henderson Water Utility service area. BID OPENING: Sealed Bids will be received until 1:30 p.m., Local Time on 10 May 2019, in the offices of the Henderson Water Utility (HWU), 111 Fifth Street, Henderson, Kentucky, 42420. After the official bid closing time, the Bids will be publicly opened and read aloud. Questions regarding the Bid Documents and Plans should be directed to Kathy Ambrose, Purchasing Director, at the address listed above, during regular business hours. Telephone: 270.826.2421. LEGAL PROVISIONS: Bids shall include all required submittals as identified in the Bid Documents. The Boil Water Advisory issued for portions of the City of Henderson on April 14th has been lifted. It is advised for customers to run a 5 to 10 min flush at all their taps and throw away all ice. HWU Crews completed work on a major water main break near the intersection of S. Green St and Vine Street on Monday afternoon. The leak was on a 20" water main that serves large areas of Henderson, including the East End, Corporate Park, Sand Lane and areas to the south and east of Downtown. Due to a drop of pressure in some areas, a boil water advisory was issued for the area from Clay Street to Drury Lane, and from the Ohio River to KY 2084 (Old Highway 41 South). The advisory had to remain in effect until bacteria testing in the affected areas was complete, and those tests results were obtained at 2:19 p.m. on Tuesday, 16 April. We regret the inconvenience caused by this BWA and thank our customers for their patience. • S. Main Street – Drury Lane to Clay St.
Schools impacted were Jefferson Elementary, South Middle School and South Heights Elementary. HWU Crews are completing work on a major water main break near the intersection of S. Green St and Vine Street. The leak was on a 20" water main that serves large areas of Henderson, including the East End, Corporate Park, Sand Lane and areas to the south and east of Downtown. The section of leaking water main was completely isolated, and pressure was quickly restored in the water system. However, due to a drop of pressure in some areas, a boil water advisory was issued for the area from Clay Street to Drury Lane, and from the Ohio River to KY 2084 (Old Highway 41 South). See map below. Today (Monday), crews are attempting to complete the repair, but a repair collar has developed a small leak. Additional parts are being assembled and installed this morning. If this work successfully stops the leakage, the area immediately downstream from the leak will be flushed and the entire system will be back in service. Regulations require us to perform tests for bacteria in the water after the leak is completely repaired, and those tests require at least 18 hours to complete. At this point, we expect the Boil Advisory to be lifted sometime Tuesday morning, April 16th. Welcome to Henderson Water Utility’s Website. This site contains information about Henderson, Kentucky’s Henderson Water Utility, the services we offer, and other information of interest to the community. The Water and Sewer Commission meetings are normally held at the Bobby Gish Administrative Building located at 111 Fifth Street on the third Monday of each month at 4:30 p.m. local time. Please call 270-826-2421 if you have any questions concerning the meetings. Henderson is a “Combined Sewer System” community. In the older parts of the city, we have combined sewers that channel both sanitary and stormwater to the wastewater treatment plant when it rains. In newer parts of the city, we have a separate storm sewer system. 2018 Henderson Water Utility North annual water quality report is available. 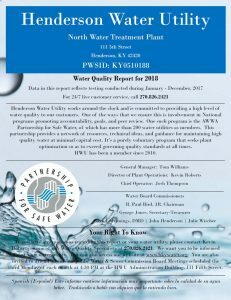 Please go to www.hkywater.org/ccr/north.pdf to view your 2018 annual water quality report or to request a paper copy call 270-826-2421. 2018 Henderson Water Utility South annual water quality report is available. Please go to www.hkywater.org/ccr/south.pdf to view your 2018 annual water quality report or to request a paper copy call 270-826-2421.